It has character, I like it. I just like the name Suzie. This site is huge, is there somewhere you can read the main points of the JB case ? Been reading through the threads and I am a little confused! Police reconstruction of Jodi's last movements. Jodi left home at about 4.55pm on Monday 30 June 2003 telling her mum to keep her some of her favourite lasagne that she was cooking for tea. Also at home was Jodi's brother Joseph and her mum's partner Allen Ovens. 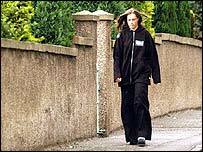 Jodi had been grounded of late when her mother found out that she had been smoking cannabis with her boyfriend Luke Mitchell. She did not expect to be getting out this particular evening so was pleasantly surprised when her mother told her that she could go out as long as she was back by curfew. Jodi used her mum's mobile phone to phone Luke as her own phone wasn't working and they arranged to meet up after 5pm. What's your stance on this case John? It sounds familiar, think i can remember it being in the news a lot. My stance?...well that is an interesting question since it has changed somewhat the further I investigated this case. At the outset I could not believe that what was being alleged could ever possibly have occurred but like most things the passage of time and the uncovering of certain inconsistencies has led me to believe that there is doubt. My stance therefore can be defined as going from believing Mitchell was innocent to now sitting on the fence with several unanswered questions. It is not as if the questions haven't been asked of those who are closest to Mitchell, it is a matter that they choose to either ignore them or cannot answer them. In relation to the website which the previous poster has chosen to highlight, I must warn that this is a pro Mitchell site and will not allow anti Mitchell arguments to be raised. It should not therefore be taken seriously in any way since it is not a true forum but a front for a most heinous slander campaign being conducted against the victims family. I would also add that the poster Suzie is none other than the Wrongly Accused Person site owner who is reputed for his scamming and spamming, the above post being such an example. Thanks John... One thing that strikes me is how much he has aged in the pics you have put up. No surprise there, given his experiences of course. Did this lad have any history of violence or disorders? Unanswered questions... you've come to the right site for that! (main site). Suzie as in Quattro? :D You can look here http://www.jeremy-bamber.co.uk/ . But it is Bamber's official site. There is a page on the prosection's case. I'm unsure as to how watered down it is. He has indeed aged in what is now nearly 8 years since the murder. Below is another picture taken a short time after the murder with Luke depicted in a Parka jacket. This picture has been the subject of much controversy since it was stated that he owned such a jacket prior to the murder when the evidence by his family was that he did not. I will come back to this later when I have decided how to fit in the various elements of the case in a single thread. It should also be noted that a witness gave testimony that a youth fitting Mitchell's description was seen near to the murder scene some 30 minutes after the murder. He was wearing a similar black t-shirt with white writing on it. The type of jacket worn by this youth is now also the subject of some debate, I will come back to this issue soon. Thanks for that link, dont know how I missed that. That's awful. Her mum's gonna be desolate about not enforcing the curfew. Not a bad site imo. Forum seems to be the place to be tho at the moment. Am I right in saying that Luke Mitchell wore a bomber jacket to school that day and that was what he was seen wearing later that evening when seen by passing motorists?? I believe that Jodi's mother and partner went to visit her late husbands grave later that afternoon after Jodi had left to meet Mitchell. As far as I can see that left Joseph without any alibi. I also believe Joseph has some anger management issues, I wonder was this why Jodi was not allowed to be alone with him in the family home. Maybe you can clarify this for me. That is quite true Sandy, he was in the habit of wearing a Bomber jacket similar to the one depicted below. Evidence was however given in court by one of Mitchell's former teachers to the effect that he had previously worn a Parka jacket to school. 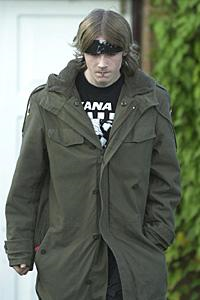 This is refuted by Mitchell's family who claim that the parka jacket in which he is depicted above was purchased after the murder when police investigators took most of his clothing for forensic analysis. Several motorists came forward and gave evidence about seeing a youth fitting Mitchell's description loitering about on Newbattle Road after 5.50pm on the day of the murder. Mitchell for his part does not dispute this and states in statements that he was waiting for Jodi to arrive. He was certainly seen and positively identified by three school boys at 5.55pm and later at 6.25pm as they returned home on their bicycles. 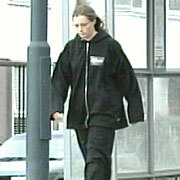 The colour of the jacket was confirmed as being green with one witness confirming that it had orange lining. The evidence in relation to the length of the jacket however varied from waist length to knee length. A witness also spoke of the youth wearing a black t-shirt with white lettering on it. 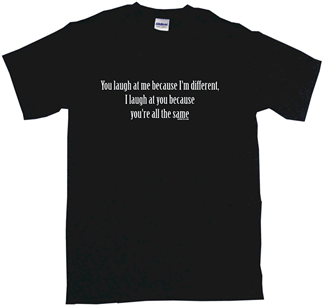 Depicted below is a t-shirt identical to that worn by Mitchell on the day of the murder. Still work out if you are for or against the accused.